The No. 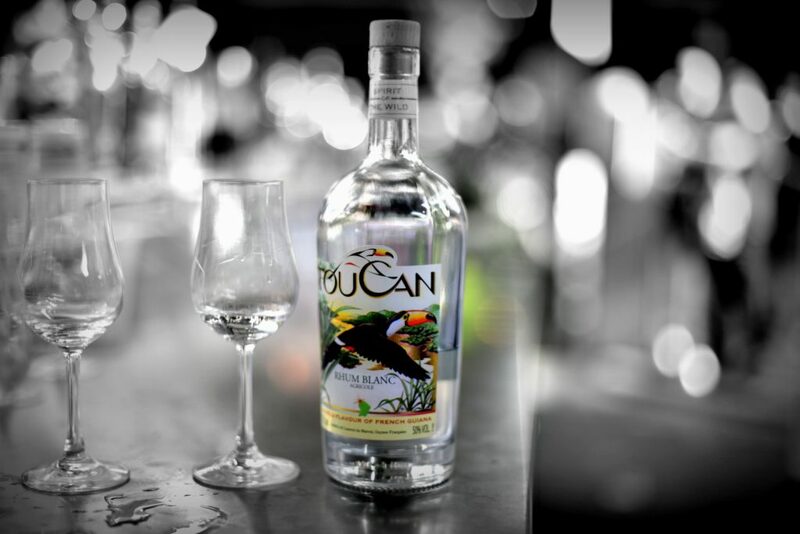 4 made by Toucan Rums from French Guiana is a small, sweet melody of a rum, playing itself out in a minor key. This isn’t a great rum, not truly pure, but I never got the feeling, when talking with the small company’s vivacious Directeur-General, Cat Arnold, that they really meant it to be. The sense was more that they set out to indulge their passion, and there are parallels to Whisper Rum from Antigua here: in both cases a pair of French entrepreneurs bootstrapped a tiny operation, refused to go through brokers, and sourced rum from a country’s much bigger distillery directly. They built a structure on excitement, and made exactly what they wanted – a relaxed, easy rum that isn’t out to redefine the concept so much as show that a good rum doesn’t have to be supported by loud social media bombast, a jillion dollar marketing budget or a Rum Name, to be noticed and applauded. It just has to be original and a decent drink. They’ve succeeded quite well in my estimation, as might also be implied by the gold medal it won in the 2017 Berlin Rumfest. Bottled at a mild 40%, it was touted as sugar and coloration-free (but see my notes below), and derived from the same single-column-still sugar-cane juice as the very excellent Toucan White, bottled at a hefty 50%. What this presents when one smells it, is rather unusual – slightly salty, unsweetened chocolate, aromatic cigarillos, sugar water and pears, with some edge provided by a vague bitterness – that sort of profile doesn’t always work, but here it provided a delicate counterpoint to more traditional aromas and it was far from unpleasant. The palate is extremely mild and very light, so if one is trying it neat (as I did), some concentration is needed otherwise the faint flavours disappear quickly. Still, they are intriguing within their limits – nuts, cola and fruitiness being immediately evident, for example. It displayed, even at that low strength, some sharp and jagged edges which I liked, and highlight the youth of the rum. What distinguishes the Toucan No. 4 is the way it combines the profile of a good cachaca (it has vague woody notes characteristic of the Brazilians), with a sort of low-rent Jamaican (those funk and esters), together with a gradually emergent taste of dill and sweet ginger. There are also some toffee and sugar water notes, which keep mostly in the background, and the combination of all these is done quite well. The finish is probably the weakest part of the experience, since there is insufficient strength to showcase any closing uniqueness, and underlines the frailty of the construction. However, fair is fair – sugar water, dill, some very light citrus and grass notes are there, and it would be remiss of me not to mention them, or how well they play together. Let’s quickly go through the background of the company. You can easily ignore all the marketing blah of both the company’s website and the one from St Maurice (the French Guiana distillery of origin), with their pretty pictures of mist-shrouded tropical vistas, and heady statements about being close to the equator or slow reduction of the rum. This is all marketing. The facts on the ground are that Toucan sources rum stock made on St. Maurice’s column still — sugar cane juice origin with a 48-hour fermentation period — ships it to Toulouse in France and there it rests in steel tanks for six months, before being reduced over six hours to standard proof; then it is aged in armagnac casks for fifteen days and then given a wood infusion (essence of three different types of undisclosed woods, so I was told) for another fifteen days. Hence my remark above, about not being “truly pure”. All this is described honestly and clearly on the back label. The process makes for a nearly unaged, infused and finished rum, and while normally I have no particular interest in such rums (which is why you don’t see many of them in my reviews), here I can’t really argue with the final result, because none of it was excessive or overbearing. It is a really nice rum: it’s pleasant, sippable and unaggressive, well made, modest…almost bashful. It’s tasty as all get out for its low proof, and when I spoke with the very expressive and enthusiastic Ms. Cat Arnold (half of the two-person husband-and-wife team which makes it) and mentioned that it should really be stronger to be better, she remarked that Benoit Bail had just told her exactly the same thing, so they’ll be looking to make some changes in the future. When your rum gets on the agricole tour and makes waves around facebook and wins prizes right out of the gate, you’re probably doing something right. Press like that is worth the rum’s weight in gold, and here I’m adding my own voice to those who already know that the tiny company produces some very interesting juice. The rum is not a world beater by any means, but it’s got oodles of potential, a very original and well-assembled profile, and we should watch out for more, stronger and better from the company in the years to come. For the moment and until they issue No.5 or No. 6, you won’t be short-changing yourself if you spring some coin for this demure little rumlet from French Guiana. It’s a pretty nifty, low-key drinking experience with little or no downside for the casual drinker. 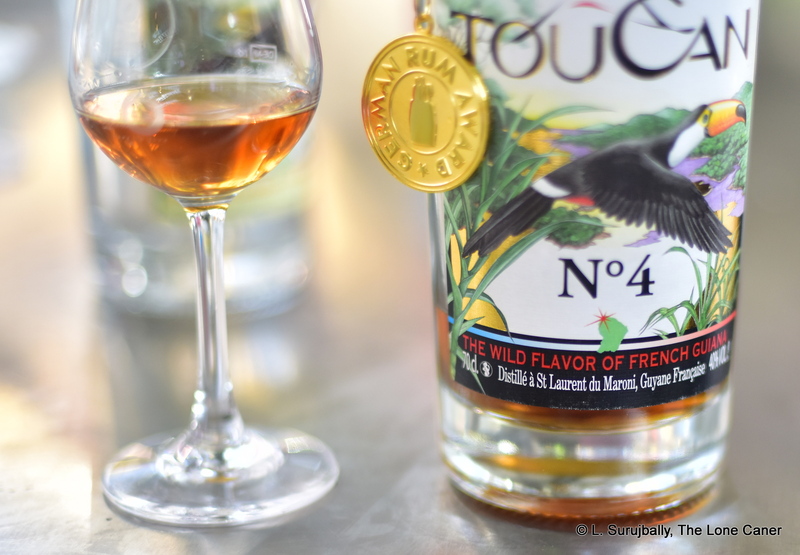 The back label reads: Let yourself be captivated by the Toucan # 4 agricultural rum of French Guiana. Monovarietal cane, cut 100% by hand, long maturation, slow reduction with pure water, passage in Bas Armagnac, infusion of wood and no added sugar for this exceptional spirit drink. The “No. 4” is preceded by a white, a vanilla, and a spiced version called “Boco”.